Why age without a fight? 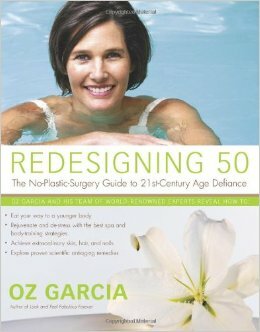 In Redesigning 50, Oz Garcia delivers a comprehensive must-have guide to reversing the aging process. Drawing on the foremost expert opinions in the health and beauty fields, Oz offers the latest, most vital information about diet and nutrition, exercise, skin and body care, hormones, stress reduction, dental and cosmetic treatments, and nutraceuticals—giving readers exactly the tools they need to look younger and feel better than they have in years. No other book offers this kind of breakthrough information in an easily customized program. Among the notable contributors to Redesigning 50 are chef David Bouley, restauranteur Gennaro Sbarro of Salute in Manhattan, hair stylist Frederic Fekkai, David Barton of David Barton gyms, Oculoplastic Surgeon Dr. Lisa Zdinak and the famous dermatologist Dr. Nicholas Perricone, to name just a few. Gleaning the most essential, cutting-edge information from the top experts in their fields, Garcia has developed a truly enlightened and effective approach to anti-aging. Hundreds of Garcia’s clients—women and men from across the country—have found success under his supervision by sticking to a prescribed exercise and diet plan, undergoing a gamut of treatments, and/or making several lifestyle adjustments. The powerful results are well-documented in case studies and testimonials throughout the book, inspiring readers to chart their own progress. As a generation of baby boomers grapple with the signs of aging, Oz Garcia comes to the rescue with the complete program they need to fight back. The result? Middle age has never looked or felt so good!